Home is the hunter, home from the hill. The freezers are bulging with venison and other good things waiting to be turned into gourmet class meals. This article deals with venison, but applies to any lean wild game, like elk, antelope, moose or domestic goats. "I don't like the wild taste of venison". How many times have you heard that? When properly dressed and processed, venison does not have a wild taste. The different flavor comes from the lack of fat in the meat. Deer run around a lot and do all the aerobic exercises and they have flat, hard bellies because of it. The lack of fat in the tissue also means that wild game will get tough if it is overcooked. Domestic meat has lots of fat in it. The fat tastes good, especially in beef. According to everyone I know, the best part of the deer is the back strap, which is the loin of the deer. It is naturally tender and juicy. Here in the Texas Hill Country, the favorite way to cook back strap is to slice it into half-inch slices, season with salt and pepper, give it a light coating of flour and fry until it's just pink in the center. For breakfast, along with your eggs, biscuits and gravy, it has no peer. A grilled back strap is high on the favorites list, too. It just needs marinating and grilling until pink in the center stage. The larger cuts, such as the hams and shoulders, just beg to be barbecued. A baste with plenty of oil in it is in order here. The fore- and hindquarters can be sliced into great round steaks. Just don't slice them too thin. Three quarters to an inch thick is best. The ribs are grilled, again with the oil baste. The trimmings and other parts go into bambiburger (hamburger) or sausage. 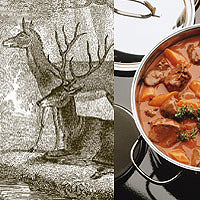 The venison is mixed with equal portions of pork for these two applications. Sauté the onion in the butter, add the garlic and cook until onion is clear. Add all other ingredients and bring to boil. Remove and allow to cool. Mop down the meat with the sauce and let it dry. Just before putting it on the grill, give it another coat of sauce. Continue to baste at regular intervals until done. Any wild game will be more tender and flavorful if you treat it to a good marinade bath before cooking by any method. Try the following. Bring to a simmer for two minutes, then allow to cool. Place the meat in a plastic bag, pour in the marinade, expel the air and close. Refrigerate for 2 hours to 2 days. Remove the meat from the marinade. Drain the marinade into a saucepan and bring it to a boil. Use it to baste. One venison ham or shoulder roast, three to four pounds. You will also need a large Dutch oven or other heavy pot with tight fitting lid. Give the roast a good coating of Lawry's Seasoned Salt. Rub it in good. Give the roast a light coating of flour. Put about an eighth inch of oil in the pot and bring up to medium-high heat. Brown the roast on all sides. Turn the heat down to low. On top of the roast, place one bell pepper, sliced, and one large onion, sliced. Put the pepper next to the meat. Add vegetables of your choice. I use carrots, potatoes, turnips, sweet potatoes, cabbage, more onion and any other vegetables I have on hand. Sprinkle the vegetables with more Lawry's Seasoned Salt, not too much. For your first attempt you should add about a half cup of water to avoid scorching until you get the heat adjustment down. Put the lid in place. When the pot begins to simmer, adjust the heat until you can just hear the sizzle. After about four hours the potatoes and carrots will be fork tender. The roast will be done to a turn. Remove the vegetables to a large bowl. Put the roast on a suitable platter, let it rest about ten minutes, and then slice. You can thicken the delicious gravy in the pot with a little flour dissolved in about a half cup of cold water. Bring the pot liquor to a boil before adding the flour mixture. This pot roast, along with some home-baked bread, makes a fine meal for special occasions. Get out your heaviest, largest stew pot. [Note: Always start with your biggest stew pot. If you start with a small one, you will find you have too much stuff and have to get a bigger pot. It always works that way.] Sauté about a pound of cubed venison that has been seasoned with salt and black pepper and dredged in flour, in the oil of your choice. When the meat begins to brown, add one-half cup of fine chopped onions and one-half cup of fine chopped bell pepper. Continue browning until the onion and pepper are limp. Add enough water to cover the meat a couple of inches (use very hot or boiling water) and bring to a slow boil. Add cubed potatoes, carrots and some pearl onions if you can find them. If not, slice another large onion and add the slices. Add a large can of stewed tomatoes. Every time you stir the stew, break the tomatoes up with the spoon. You can add any other vegetables of your choice. Treat the venison just like any other meat, but use the recommended basting sauce and don't overcook it. Just before it's done, give it a coat of your best finishing sauce. Serve with your favorite dipping sauce. Give your venison steaks a good seasoning with your favorite seasonings. Let them set until they reach room temperature. Brush them well with a good grade olive oil and slap them into a very hot, heavy skillet. About three minutes per side should do it, according to your taste, a little longer or a little less. There. We have cooked up all that venison. It won't be long until the menfolk start bringing home the fish. Better get some cornmeal next trip to the store.